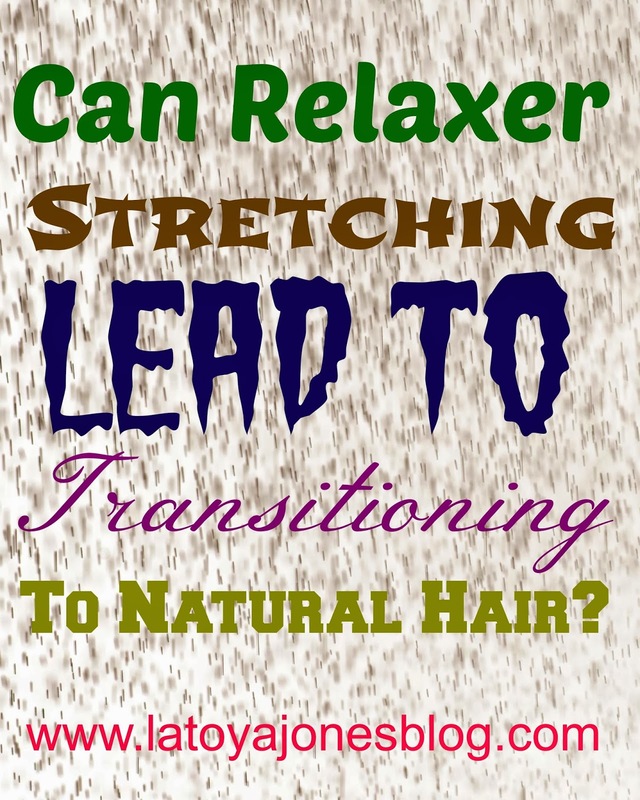 Could Relaxer Stretching Lead To Transitioning To Natural Hair? Today I had a client that has come a long way as far as relaxer stretching. She used to get her relaxers ever six weeks like clock work (until she started coming to me). Once she started coming to me I began encouraging her to stretch her relaxer out to see her hair become healthier and grow faster. She was reluctant at first but eventually agreed. My goal for her was to get her relaxers every ten to twelve weeks. To my surprise she has passed my goal for her and made it thirteen weeks! Despite me giving her the green light to get her relaxer at twelve weeks, she said she would keep it going since I was able to get her hair straight without getting a touch up. The only problem is that she is afraid to shampoo her hair on her own. She said as long as she comes to me she is fine because she can simply maintain what I do. Once she gets her hair wet, she does not know what to do with it when she is all alone. Take a look at her new growth at week thirteen. Her new growth stops at where my thumb is in the picture above! Remember that healthy hair grows at a rate of about half an inch per month. So, every two months (8 weeks) you should have at least an inch of new growth. This client has gone three months (13 weeks), so on average she should have at least 1.5 inches of new growth. She has already gone past that! All of the curly part is new growth! She has almost three inches of new growth which is double the average rate she should have. How did she do that you ask?? She comes to see me approximately every two weeks and at every visit I use only Silk Hydration by L. Jones products on her hair. I use the clarifying shampoo, the (new and improved) moisturizing shampoo which has quickly become one of my favorite items in the entire line now, the leave-in conditioner, and the daily conditioner. She drinks the recommended 48-64 ounces of water per day and she does not apply heat to her hair in between her visits. 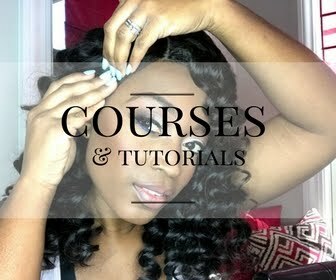 See how easy it is to grow your hair?! The numbers on the comb above represent inches. You can see that she is very close to having three inches at only three months in. She likes to wear her hair straight so take a look at her after pics. Seeing her hair this straight has motivated her to see just how far she can go. She has put the idea out there that she just might transition and go completely natural but has not committed to that just yet. Either that or at least she at least wants to go six months. She now can not believe that she used to go only six weeks in between relaxers. 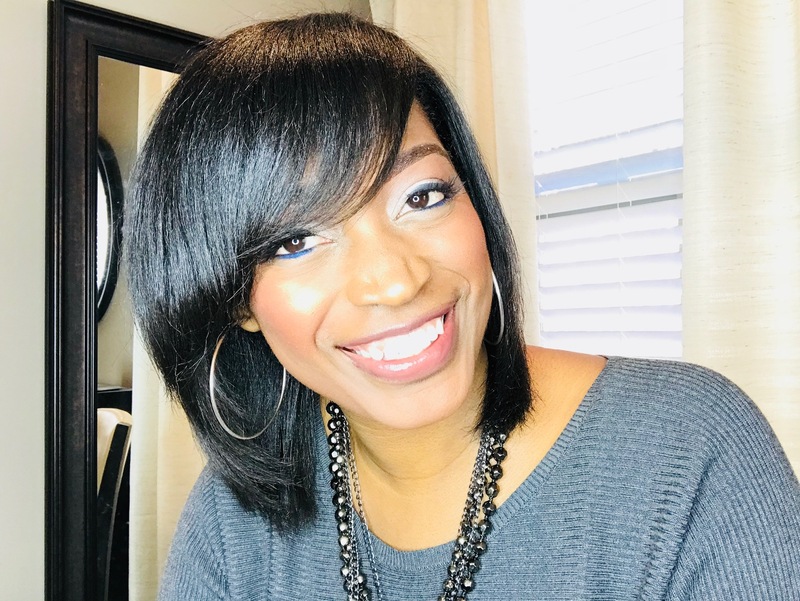 From a professional point of view, six weeks is just not enough time to get enough new growth to relax without overlapping and getting relaxer on the hair that has already been relaxed. 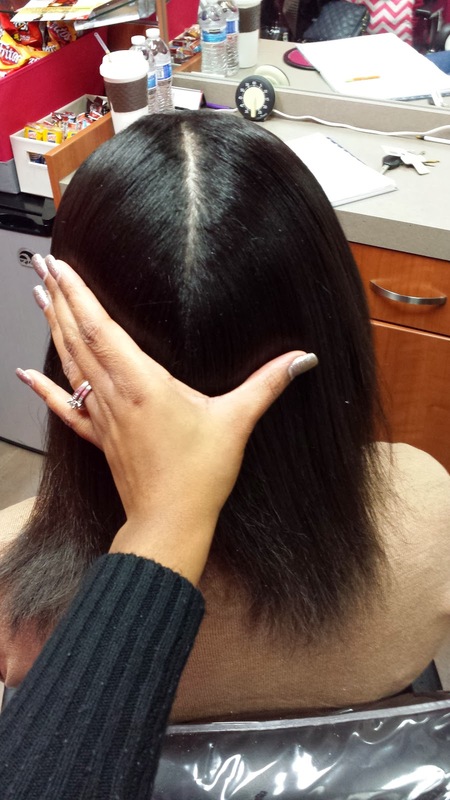 Overlapping is the reason why a lot of women experience breakage and shedding once you get to six weeks with your relaxer. 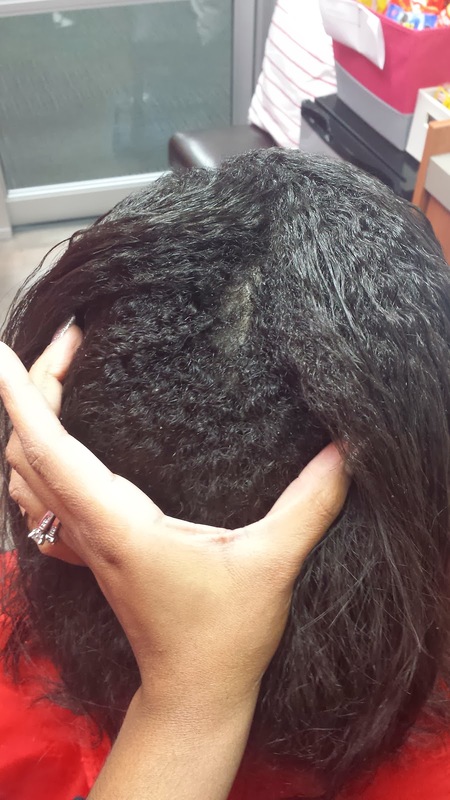 It is because the line of demarcation, or the line where the relaxed hair meets your natural new growth, has been over-processed which makes that area of the hair weaker. 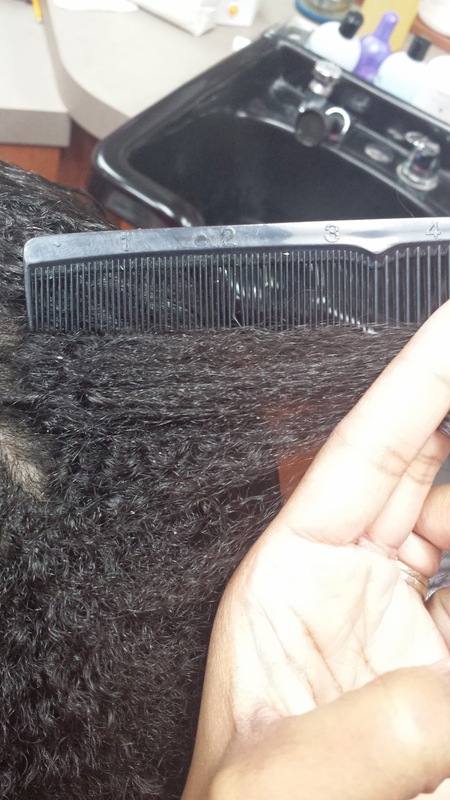 As your hair grows out and endures the everyday stress of combing, curling, etc, it begins to break and shed. 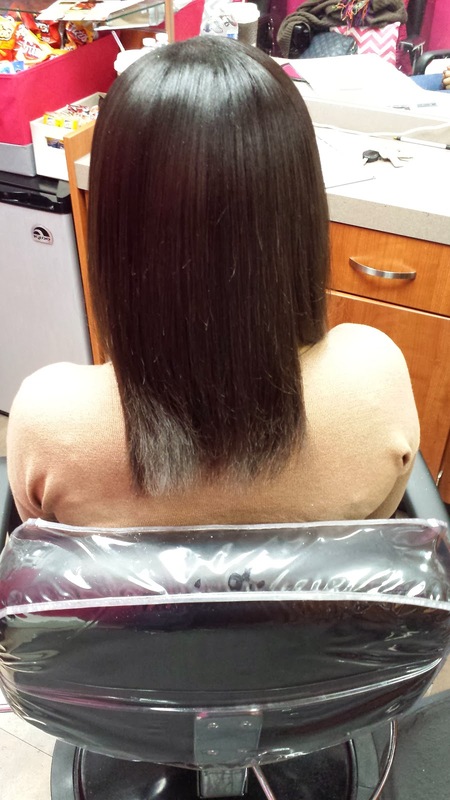 It is not the fact that you need another relaxer, it is because you have received damage from overlapping. 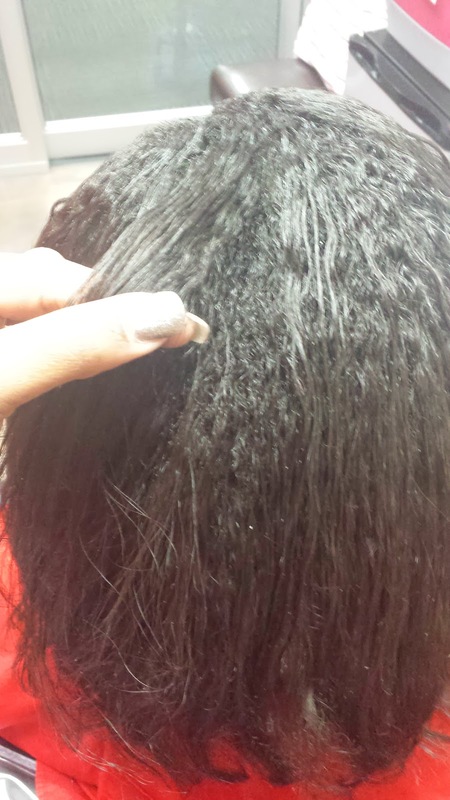 Stretching your relaxer is the way to avoid this. 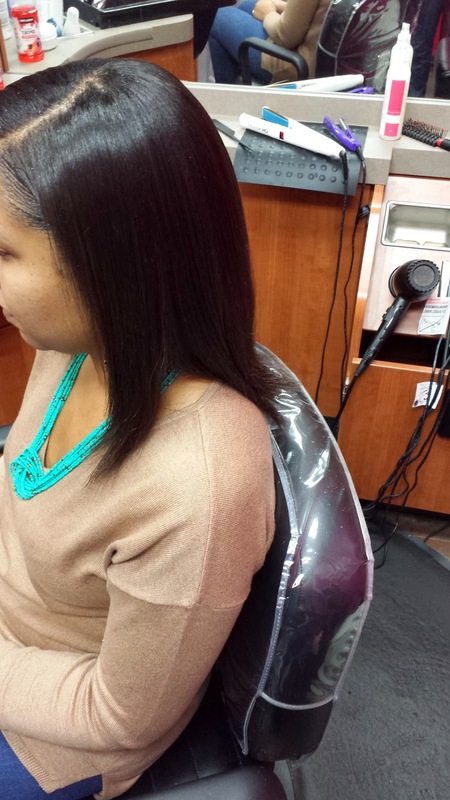 You need to have at least two inches of new growth before even considering a relaxer. 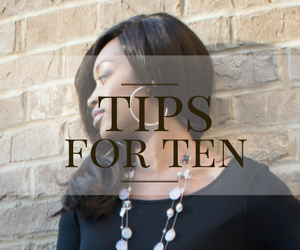 And your hair can get just as straight without using a relaxer. The only thing she will need to do at this point is simply wrap it up every night. She is going to take it one week at a time as far as trying to go natural. I myself get my relaxers every six weeks. I have entertained the thought of transitioning into natural hair but I love my straight hair too much and I would never wear my hair in its natural state. So six months is just long enough for me. However, it is easy to get your mind right to fully transition when you stretch for that long. 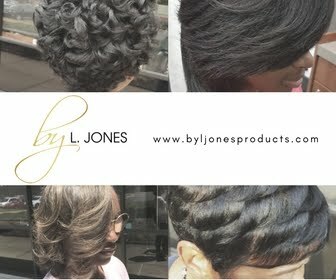 I know that my hair can be healthy with a relaxer which is why I choose to continue to get them. That way I can have the best of both worlds, relaxed AND healthy hair!